When I decided that I would like to give blogging and entrepreneurship a chance it wasn't long before I noticed claims of content being copied or stolen. Things don't always end well for those who have been copied or for those that have purposely or accidentally copied. With so many amazing idea out there it's easy to accidentally copy something without even realizing it. Even if it's an accident, you could land yourself in some really hot water and ruin budding relationships. I avoid copying others work because I know what it feels like to work hard on something only to have it stolen and copied. It's flattering to have your work admired and supported, but its definitely not fun to see a replica of your idea on someone else's site. I've come up with some ways to protect yourself from becoming an offender. If you find someone who you are completely impressed by instead of copying them or their work find a way to become of value to them. Show them the value you have to offer and then think of a way to collaborate with them. Think of a way that will be beneficial for you and them and then pitch it to them. 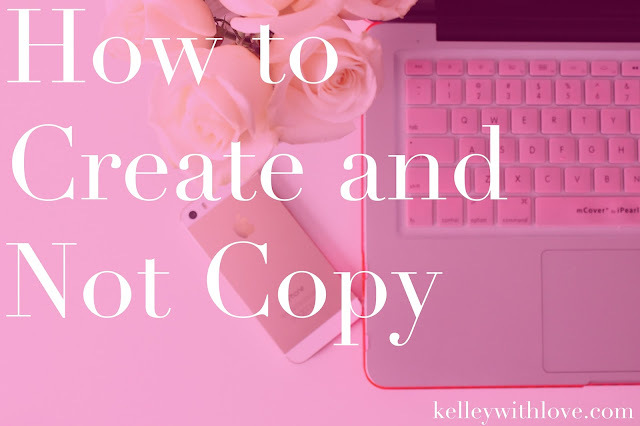 This is one of the best ways to avoid copying and in turn grow. Instead of stealing an idea, be inspired by the concept of the idea. Study it. Get to know what works and doesn't work. For example if you see someone hosting a fabulous giveaway you may be inspired to do a giveaway of your own. Instead of copying their exact giveaway, sit down and brainstorm if and when a giveaway would be appropriate for you and your brand. If it is then decide what would be appropriate and exciting to give away. Once you've decided all these things then take some time to decide a way to deliver your giveaway that is unique. Remember, be inspired by the concept instead of stealing the idea. Sometimes when we are in complete awe of a person we can inadvertently take on their mannerisms, ideas, and even their language. This can easily come off as copying. To avoid emulating try featuring the person on your site. Get to know them on a deeper level. Interview them to find out what pieces of advice, tips, and techniques you can share with your audience and use to enhance your brand, business, or blog. Sometimes this can be the difference between making a friend or an enemy. How do you avoid intentionally or unintentionally copying others?